Learn the Sleeved Total Knee Replacement for Tibial Plateau Fracture (MBT DePuy) surgical technique with step by step instructions on OrthOracle. 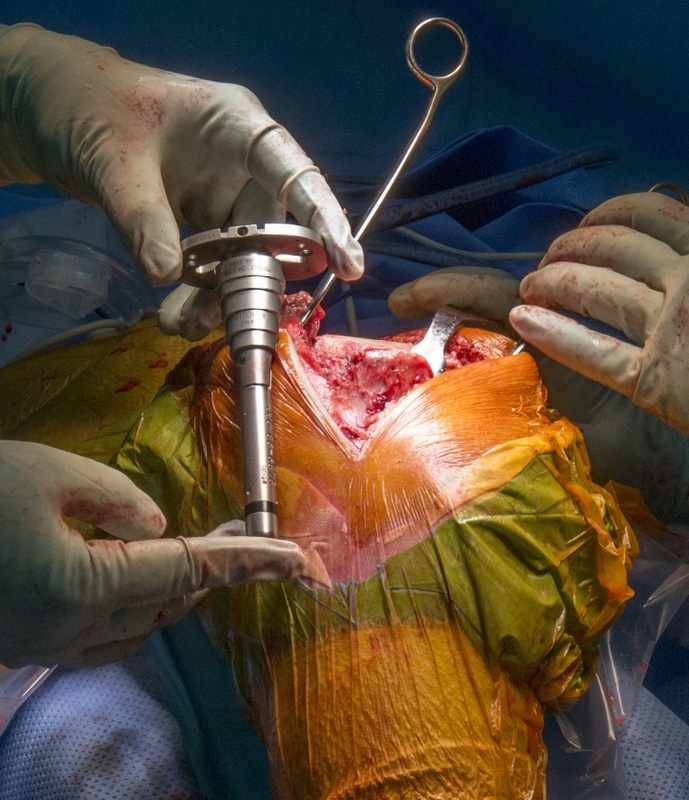 Our e-learning platform contains high resolution images and a certified CME of the Sleeved Total Knee Replacement for Tibial Plateau Fracture (MBT DePuy) surgical procedure. Tibial plateau fractures tend to occur in a bimodal pattern. Younger patients more frequently sustain injuries as part of higher velocity injuries. These injuries often form part of polytrauma and higher grade knee injuries are often associated with other knee soft tissue defects. However in the lower demand elderly patient, tibial plateau fractures can occur with significantly less force and tend to occur in isolation. Open reduction and internal fixation of this osteoporotic bone presents its own challenges and treatment of a multi fragmentary plateau fracture may be best achieved with a total knee replacement. Traditionally TKA was considered only after bony healing to allow support for implants, however recent advances in implant design have allowed the use of porous metal implants (for example Porocoat, Depuy) which assist in primary stability. The following report is of a mobile bearing tray (MBT) total knee for trauma utilising a Porocoat sleeve from Depuy. Implantation occurred 5 weeks following injury. Institution : The Northern General Hospital ,Sheffield ,UK.